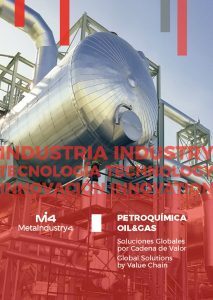 MetaIndustry4 offers a wide range of services for petrochemical facilities covering all activities from process modules or revampings to complete turnkey projects. These services pass through the entire value chain. The Cluster brings together a group of highly specialized companies in the petrochemical value chain, which is presented below. These companies have a long experience working in different links of the chain, with high quality and proven references. Thanks to theirs capacities and specialties, they can carry out complete turnkey projects that respond to the highest demands of the final client. For more information, consult our catalog of integral solutions for the petrochemical value chain by clicking on the image.